Making frittatas is usually a two-step process: Cook on the stove, then finish in the oven or broiler. 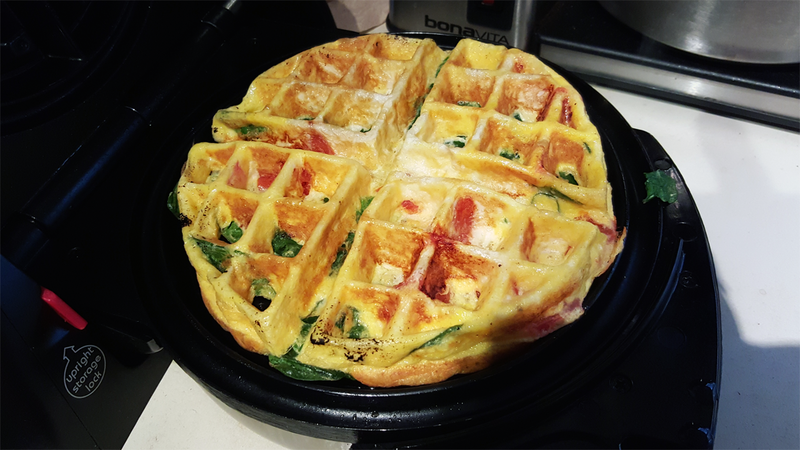 Skip a step and make a unique frittata waffle in your versatile waffle iron. All you have to do is combine eggs with your mix-ins, pour the mixture into the waffle maker and wait a few minutes. In the creation above, I used three eggs, a cup of spinach/diced tomatoes/cheese mix and cooked for about four minutes. (In hindsight, I should have added bacon or more cheese and cooked for another minute. If you have a regular waffle maker — not a Belgian one — use less time.) They came out both fluffy and crispy in parts, and enjoyable all around. While not your traditional frittata — it's more like a waffle made entirely of egg plus fill-ins — this method beats having to turn on the stove, since both sides are cooked at once. It makes an easy handheld egg dish that you can freeze and reheat for grab-and-go breakfasts. It's great for people who are avoiding wheat. And it's infinitely versatile. I'm not sure where I first saw this idea, but there's a frittaffle recipe at Real Food by Dad that looks even better (but requires you to make the frittata on the stove first then chill before using the waffle iron) and this waffle iron omelette recipe I used for inspiration. Go forth and waffle iron, whether you want to make mini calzones, mozerralla "sticks", churros, brownies, bacon or cookies. Clearly the waffle iron isn't a one-trick pony.